Chemical evolution is the increase in complexity of chemicals that led to the first cells. 1. Today, we say that "life only comes from life." 2. However, the first cells had to arise from an increased complexity of chemicals. 1. The Earth is about 4.6 BYA (BYA). d. small amounts of hydrogen, methane, ammonia, hydrogen sulfide, and carbon monoxide. 3. This chemical soup was inhospitable to life, and with no atmosphere, the earth was constantly bombarded by asteroids. 2. 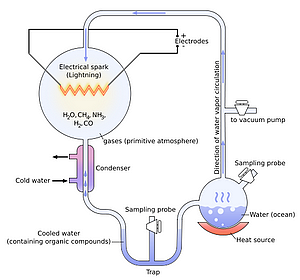 Experiments performed by Miller and Urey (1953) showed that gases (methane, ammonia, hydrogen, water) reacted with one another to produce small organic molecules (amino acids, organic acids). 3. Lack of oxidation and decay allowed organic molecules to form a thick, warm organic soup. 1. Newly formed organic molecules polymerized to produce larger molecules. 1. Before the first true cell arose, there would have been a protocell or protobiont. 2. A protocell would have a lipid-protein membrane and carry on energy metabolism. A coacervate is a tiny spherical droplet of assorted organic molecules (specifically, lipid molecules) which is held together by hydrophobic forces from a surrounding liquid. In living systems, information flows from DNA ? RNA ? protein; it is possible that this sequence developed in stages. 2. The protein-first hypothesis contends that proteins or at least polypeptides were the first to arise. 3. Cairns-Smith suggests that polypeptides and RNA evolved simultaneously. a. The first true cell would contain RNA genes that replicated because of the presence of proteins; they become associated in clay in such a way that the polypeptides catalyzed RNA formation. b. This eliminates the chicken-and-egg paradox; both events happen at the same time. Once the protocell was capable of reproduction, it became a true cell and biological evolution began. Most biologists suspect life evolved in basic steps. 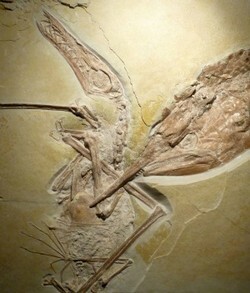 Paleontology is the study of fossils and the history of life, ancient climates, and environments. Sedimentation has been going on since the Earth was formed; the sequence indicates the age of fossils; a stratum is older than the one above it and younger than the one below it. 1. 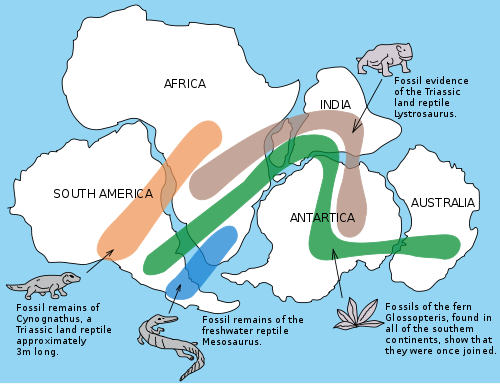 Geologists discovered that strata of the same age contain the same fossils, termed index fossils. 2. Therefore, fossils can be used for the relative dating of strata. 3. A particular species of fossil ammonite is found over a wide range and for a limited time period; therefore, all strata in the world that contain this ammonite are of the same age. 4. However, relative dating does not establish the absolute age of fossils in years. 1. Absolute dating relies on radioactive dating to determine the actual age of fossils. 2. Radioactive isotopes have a half-life, the time it takes for half of a radioactive isotope to change into a stable element. 3. Carbon 14 (14C) is a radioactive isotope contained within organic matter. a. Half of the carbon 14 (14C) will change to nitrogen 14 (14N) every 5,730 years. b. Comparing 14C radioactivity of a fossil to modern organic matter calculates the age of the fossil. c. After 50,000 years, the 14C radioactivity is so low it cannot be used to measure age accurately. 4. It is possible to determine the ratio of potassium 40 (40K) and argon 40 to date rocks and infer the age of a fossil. Geologists have devised the geological timescale, which divides the history of Earth into eras, and then periods and epochs.